Very simple to use, an existing construction line on a sketch need to be selected, then the file from which to generate the airfoil is selected. 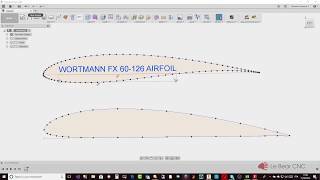 You can choose to have the airfoil name added as text on the sketch. Use existing sketch line as chord reference for the profile. Can be of any length, at any angle with horizontal. Accept CSV files, with either comma or semi-colon as delimiter. For Dat files, the name of the Airfoil can be added to the sketch, if desired. If you need to import airfoil data to your Fusion design, this is the tool to use! As intended, this add-in reads and imports any properly formatted airfoil DAT files as a spline to your sketch; Which is much more elegant and convenient than a series of lines segments. The second great thing is that, it scales and aligns the airfoil to the selected construction line during the import. Which means that the airfoil comes at the right dimension and with the right angle (provided you selected a properly dimensioned construction line). Generates a flawed spline (contains curvature errors, etc) and seems to have chosen only a few of the points contained in the airfoil .dat files. The files work with the other Fusion airfoil plugin. Could you give me a link where I could download your .dat files? Which one of the different standards are they following? Could you give me a link where I could download your .dat files? &#13;&#10;Which one of the different standards are they following? Simple and efficient. But same problem as Fabien. Sometimes the direction is not correct and I have no clue how to flip it. Works great, simple and efficient. Please add a checkbox option to reverse the direction. A simple miror will help, here.... Now, I agree it would be better if it was always consistent. Once I have some free time, I may look to make a version 2 with this corrected. A simple miror will help, here....&#13;&#10;Now, I agree it would be better if it was always consistent. Once I have some free time, I may look to make a version 2 with this corrected. This plugin does what it's supposed to and does it well! Clearly, ability to draw an airfoil on an existing sketch, first selecting the cord, allow to make a very precise wing, with proper angles where needed.